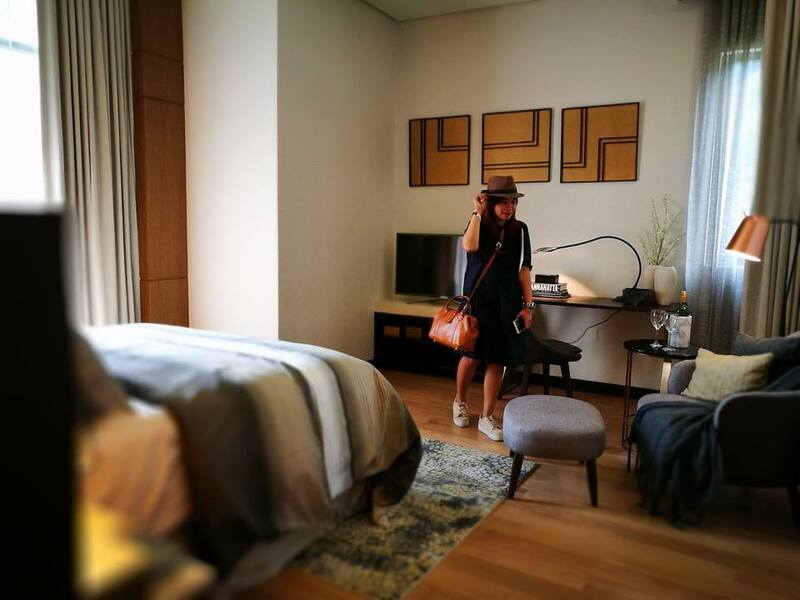 Wellness is becoming the new luxury and a symbol of social status as well. Recognizing this distinct preference for wellness and luxury, Robinsons Luxuria, the premier residential brand of Robinsons Land Corporation, has announced its partnership with world renowned Starwood Hotels and Resorts, to build a one of a kind property that thrives on these two principles. With the partnership, Starwood Hotels and Resorts, one of the leading hospitality and leisure groups worldwide is bringing to the Philippines the first Westin-branded residential and mixed-use development in Southeast Asia. Anchored on the remarkable synergy of Robinsons Luxuria’s real estate development excellence and Starwood Hotel and Resorts’ expertise in lifestyle branding, The Residences at The Westin Manila Sonata Place is set to transform the local property landscape by fusing world-class hotel experience with luxury residential living to create redefined value. 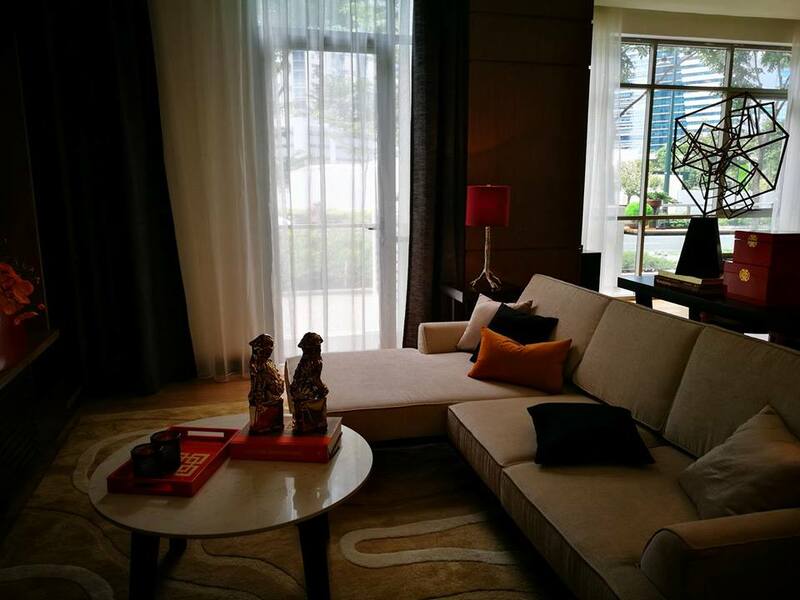 “We are positive that our strong partnership will set new benchmarks for luxurious residences in the Philippines. This project will be at the forefront of our portfolio, being the most luxurious hotel and residential project to date of Robinsons Land Corporation,” he adds. 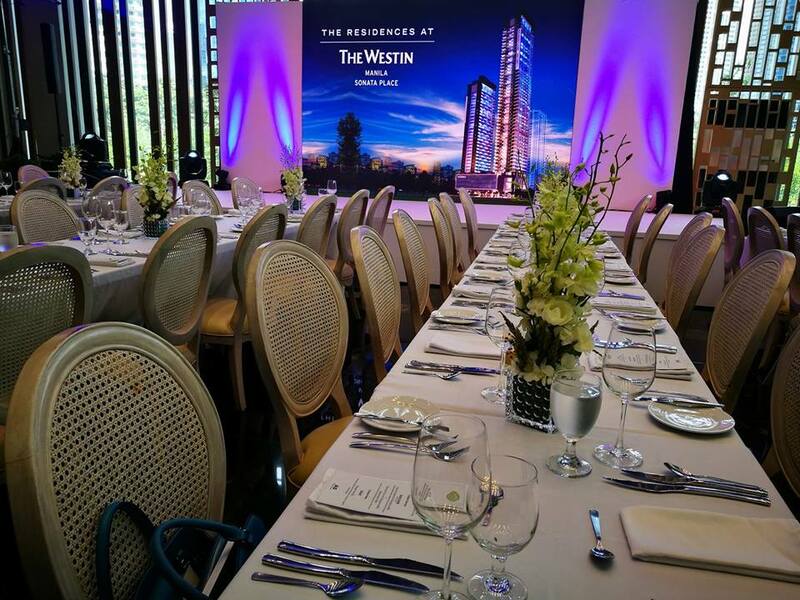 The Residences at The Westin Manila Sonata Place will rise an exclusive and private residential complex in the heart of vibrant Ortigas. 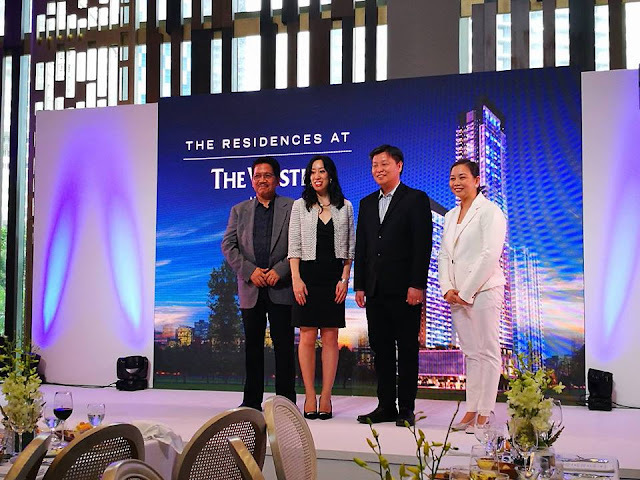 It will share an iconic address with The Westin Manila Sonata Place hotel and the existing twin-tower luxury high-rise Sonata Private Residences at the Sonata Place Complex. 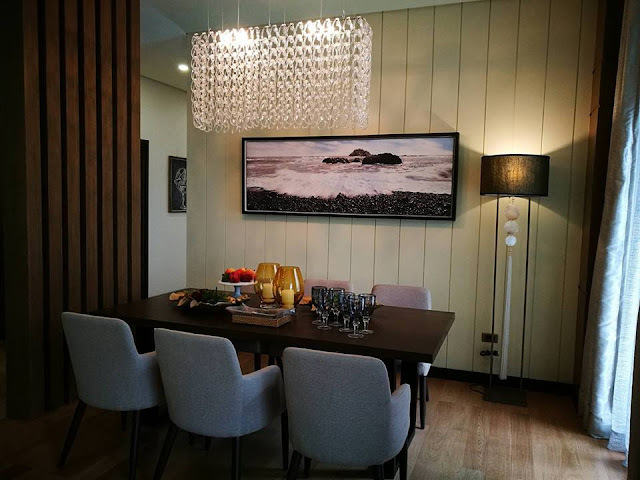 Sonata Place boasts of prime location along San Miguel Avenue, which is one of the main thoroughfares of the bustling Ortigas Center business district. It is surrounded by landmark buildings and establishments, commercial centers, key institutions—hospitals and schools—as well as offices of multinational and large corporations. 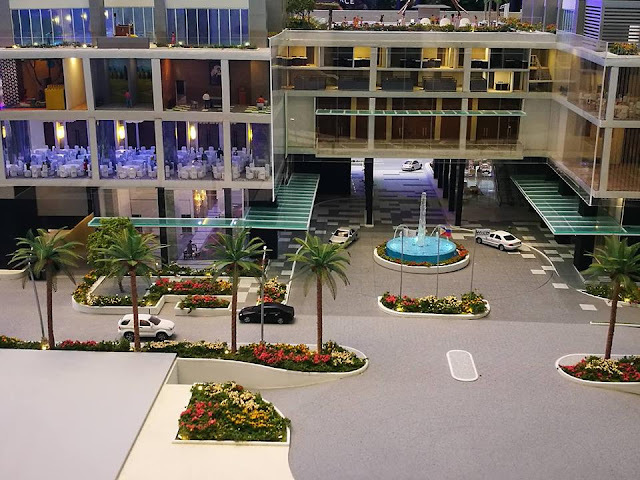 Sonata Place is in an advantageous position to cater to the expanding high-end residential market in the Philippines, comprised of highly successful and discerning entrepreneurs, professionals and executives as well as the growing population of expatriates, returning overseas Filipinos and global travellers. 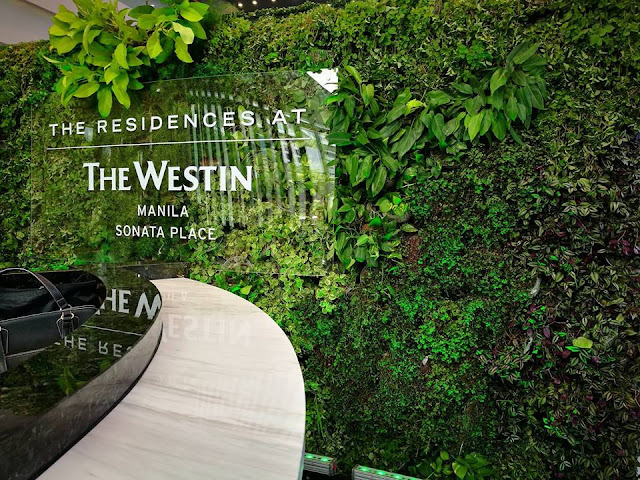 Envisioned as a distinctively modern structure with a predominant glass element to achieve understated elegance, The Residences at The Westin Manila Sonata Place will rise above the metro as a new landmark of luxury in the city. 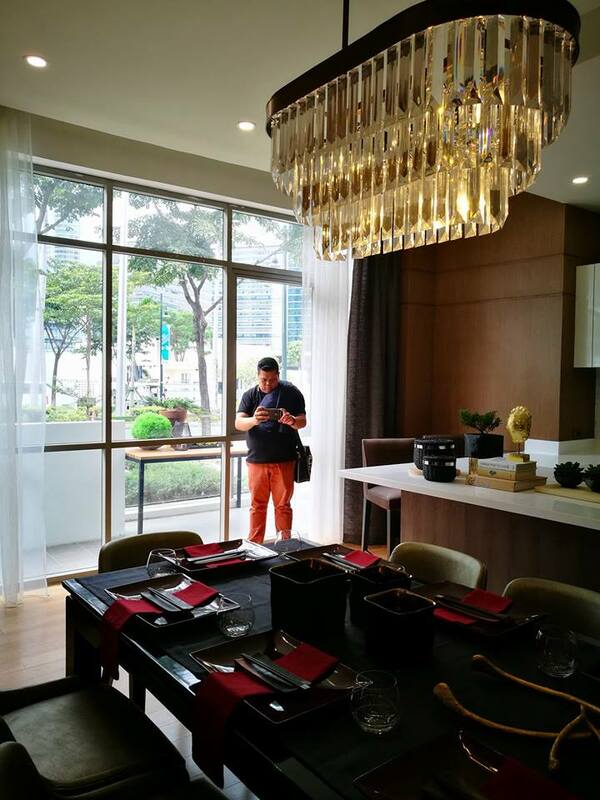 Home seekers and investors can select among one-, two- and three-bedroom units as well as premium penthouse units. 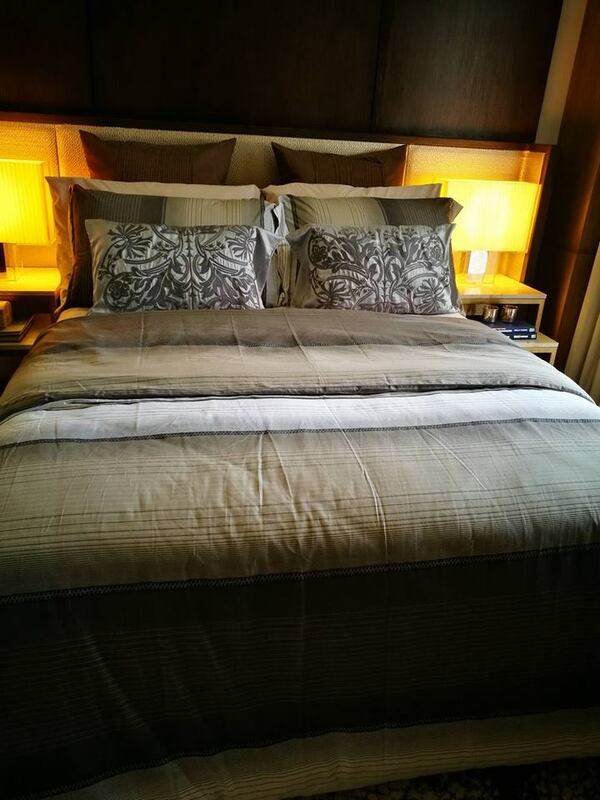 Residential units will be designed in signature Westin style, including trademark touches such as The Westin Heavenly Bed included in every Master Bedroom and the Heavenly Bath shower experience which will elevate daily living into everyday hotel experience. 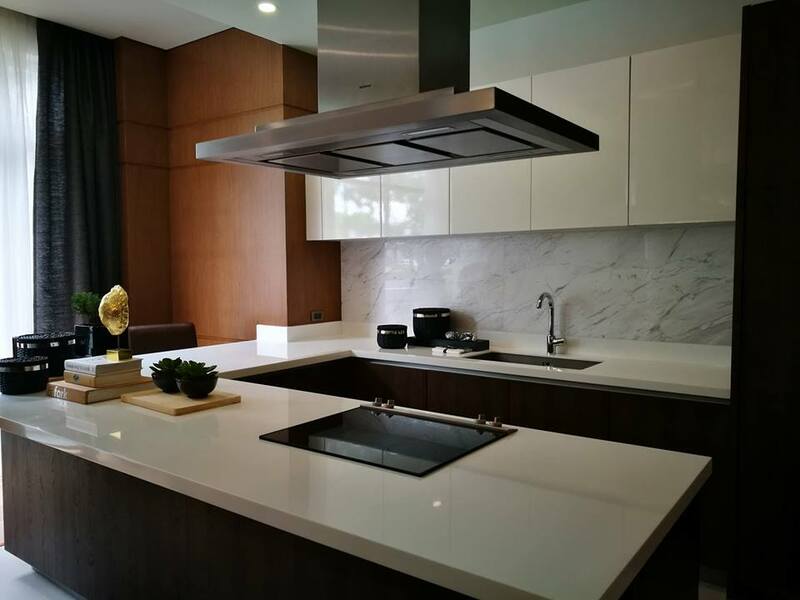 All kitchens will feature Gaggenau appliances and Leicht cabinets to make everyday cooking a pleasurable experience. Meanwhile, The Haven spans four floors of exquisite signature amenities designed for work, play and leisure. 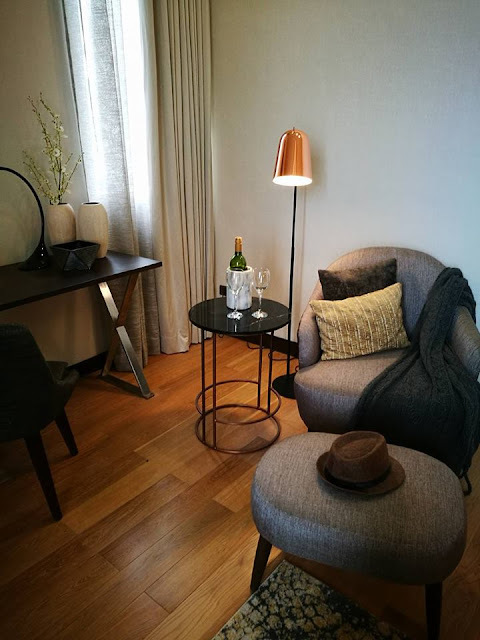 Residents will also enjoy membership in the Starwood Preferred Guest Program and access to other hotel a la carte services through the Resident’s Card. 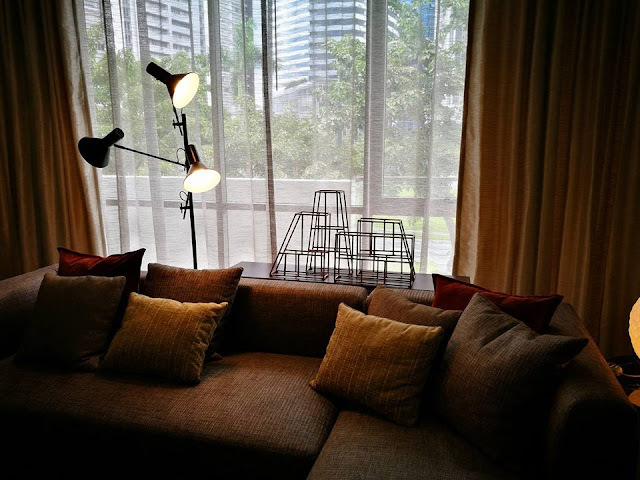 For more information on The Residences at The Westin Manila Sonata Place, call (0932) 100-0000 or visit www.sonatapremier.com. 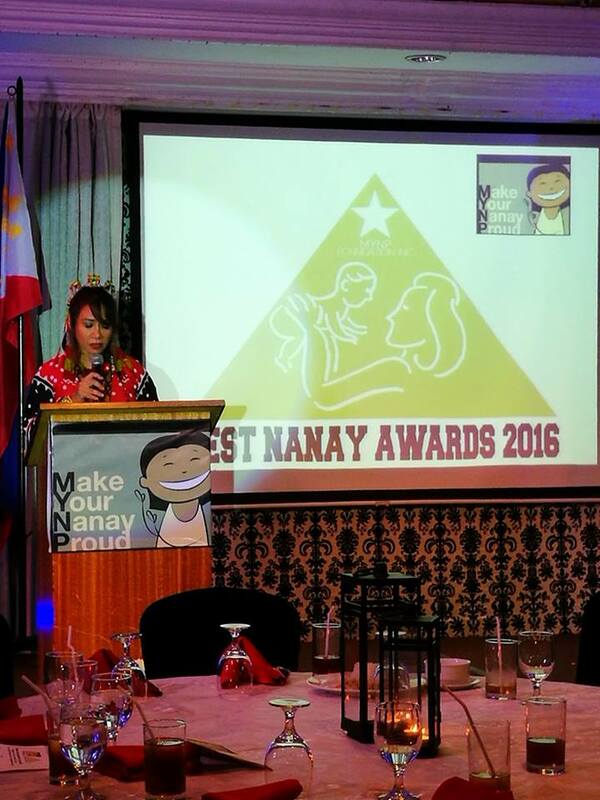 The Best Nanay Awards 2016 of Make Your Nanay Proud Foundation, Inc. was held last October 29, 2016 at the Legend Villas. Ten winners were chosen from the 630 entries from all over the country that were short listed. 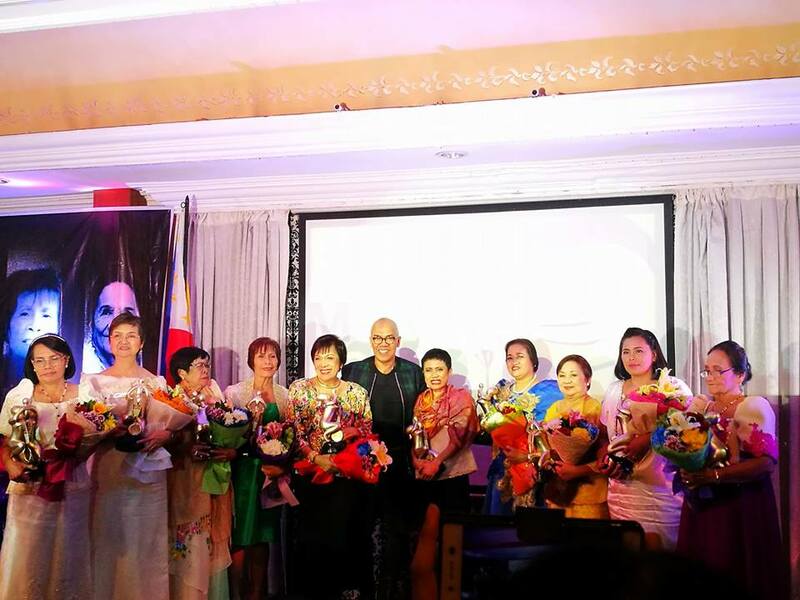 The winners of the 3rd Best Nanay Awards 2016 were Anecita Fernandez, Espirita See, Heide Aquino, Amalia Ponce, Pamela Alarin, Adelina San Miguel, Virginia Dahilan, Dolores Balana, Purificacion Ubasa, and Maritess Odarbe. The Board of Judges included Direk Jerome Chavez Pobocan, yoga teacher Lex Bonafe, Dr. Jacel Mabansag of EARIST, Barangay Chairwoman Rosa Magpayo, JT Tubil of Accenture, Arlyne Fernandez of Virlanie Foundation and Zelfa Alvaro of Couples for Christ. In his speech, MYNP founder and chairman Dr. 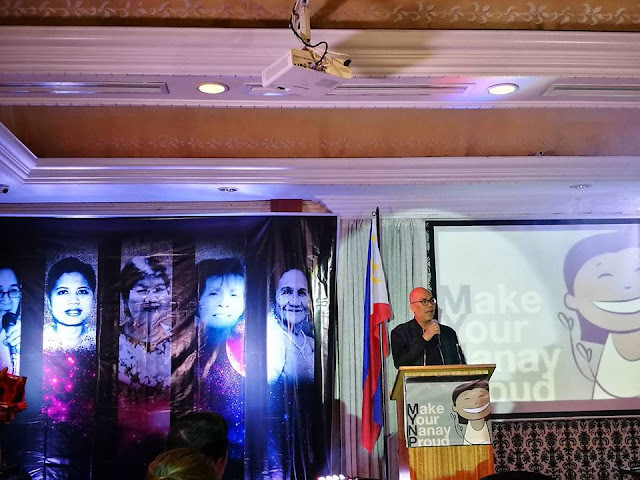 Boy Abunda lauded the roles that the awardees played not just as mothers of their families but of their communities as well. “We are here tonight because we want to deliver a message that again and again, we should keep on talking about our mothers being the best mothers. That we should keep on talking about the truth that this world is, will be a better place because of the way we treat our mothers. 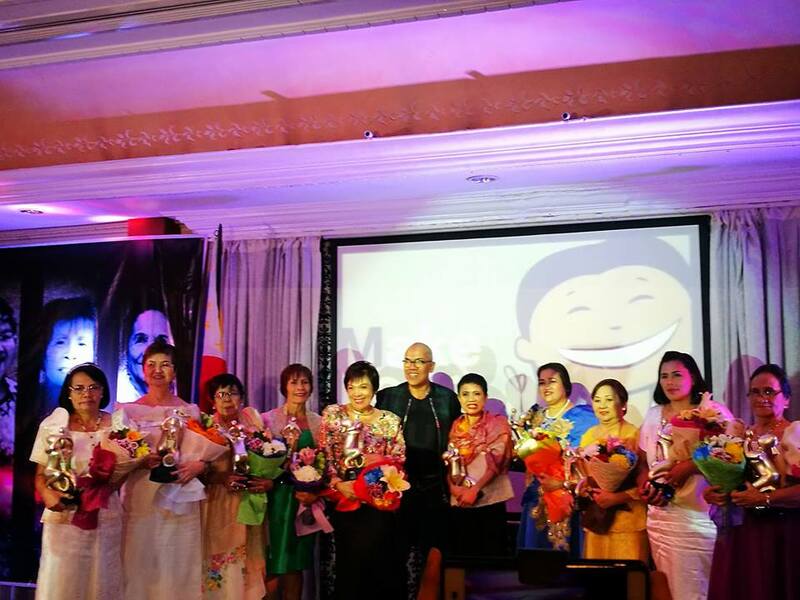 And this place is going to be a better place if we can be the best children to our mothers,” Abunda said. He also added that this is a time of our lives that we need an inspiration -- we need heroes, we need people to look up to – our mothers. In spite of poverty, Anecita Fernandez of Masambong, Quezon City, was able to send her children to school. Likewise, she helps her friends and people in the barangay with their needs in her work as barangay staff. Dr. Espirita See is an eye doctor from Cagayan Valley. A disciplinarian, she taught her children the values of frugality and hard work. Her grown-up children have also joined organizations that help the poor. 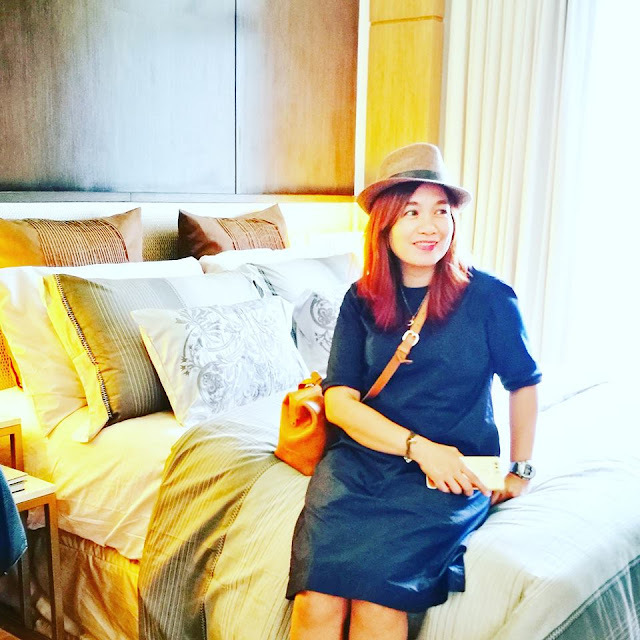 Heide Aquino is a retired professor of Spanish at Ateneo de Manila University. She spearheaded the Jolly Senior Citizens of East Kamias and sends children to college, even if they are not her relatives. Amalia Ponce is a mother not just to her family but to her community and the school where she works. Pamela Alarin is a mother who is also a tricycle driver with four children. Neighbors seek her opinion because of her positive frame of mind. Adelina San Miguel is the 73-year-old founder of Tahanang Balik-Alay, a caregiving home for the aged in Taytay, Rizal. Virginia Dahilan sent her six sons to school on a meager government salary and later helped her community as a barangay kagawad. Dolores Balana is a 61-year-old pharmacy aide at the Bataan Provincial Hospital. Always cheerful despite poverty, she sent her seven children to school. His Will – A Personal Journey from being a Person with Disability to a Person of Destiny (POD). The 10 awardees received a mother-and-child trophy handcrafted by Ifugao sculptors, cash, gift certificates and products from the generous sponsors that included M.E. Sicat Construction, Generika, Great Image, HBC, La Carmela de Boracay Resort Hotel, Techno Marine, BDO-Kamuning, International Pharmaceuticals, Inc., Orange Blush Salon, Jollibee, ChemWorld Fragrance Factory, National Book Store, McDonalds and Puregold. 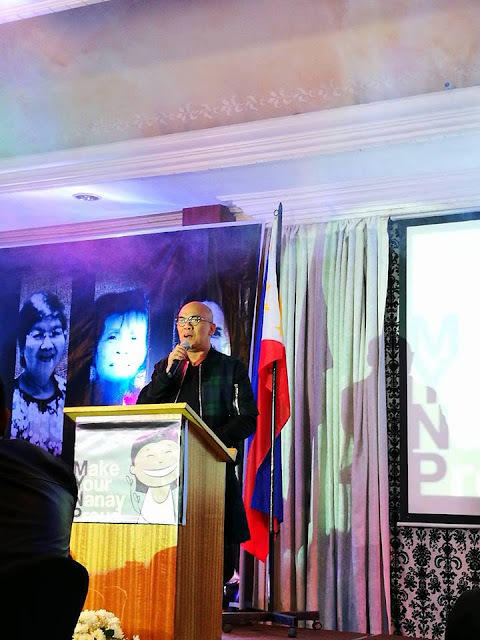 MYNP is a civic organization of Filipinos who love their mothers and who want to honor them by helping themselves, others, their communities and the country. 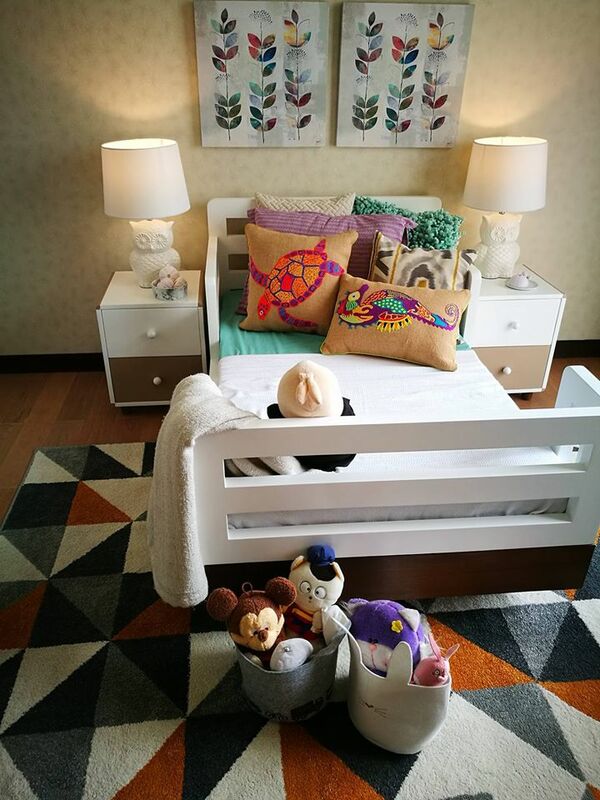 For more details about MYNP, please visit their website www.makeyournanayproud.com and FB Fanpage www.facebook.com/MYNP.OfficialFanpage or contact the office at (02) 413-5868 or e-mail at makeyournanayproud@yahoo.com. 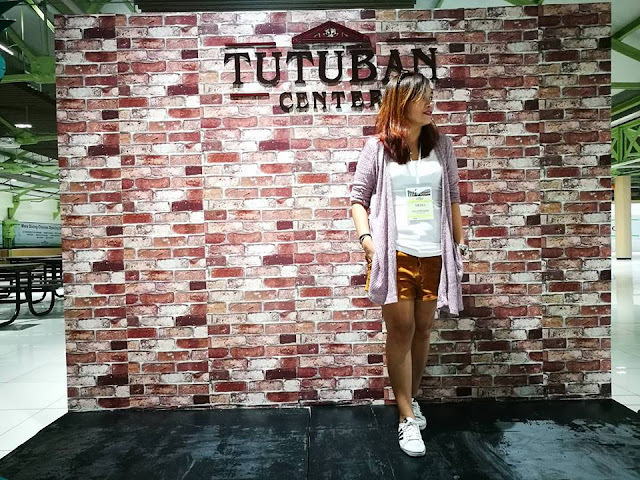 When we were still in college, my three siblings and I never thought about working abroad. Our family business had been doing relatively good, and we could never leave our parents behind. But like they always say, people change, priorities change and we have to make decisions. The first to leave was my sister Dalyn, she was a nurse and it was really the practical thing to do. After a few years, my two other brothers followed suit, but unlike my sister, they had to work several different jobs in order to support their growing families here. After all everyone want to provide their kids with quality education, have a car, build a dream house and have the chance to travel once in a while. Dalyn is now a Canadian Permanent Resident at Vancouver, while my two brothers have established themselves in Abu Dhabi. I also tried my luck 3 years ago, and applied for a job abroad. I prayed and considered a lot of things and asked for signs. 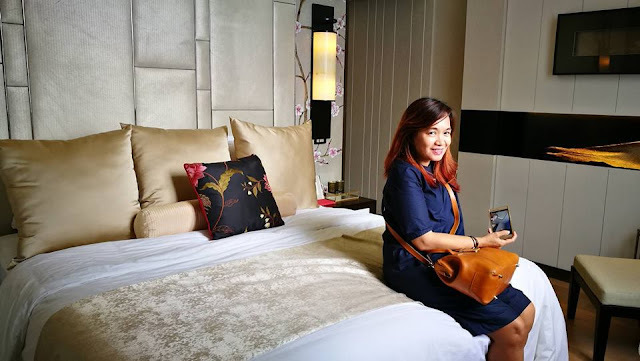 I was leaving a fairly good job which I was quite comfortable with, but at the end of every month, there was just not enough left to support my family and afford me some petty luxuries like my skincare, makeups and books. So I took a risk thinking it was my last chance of earning enough money to provide a more comfortable life for my loved ones. 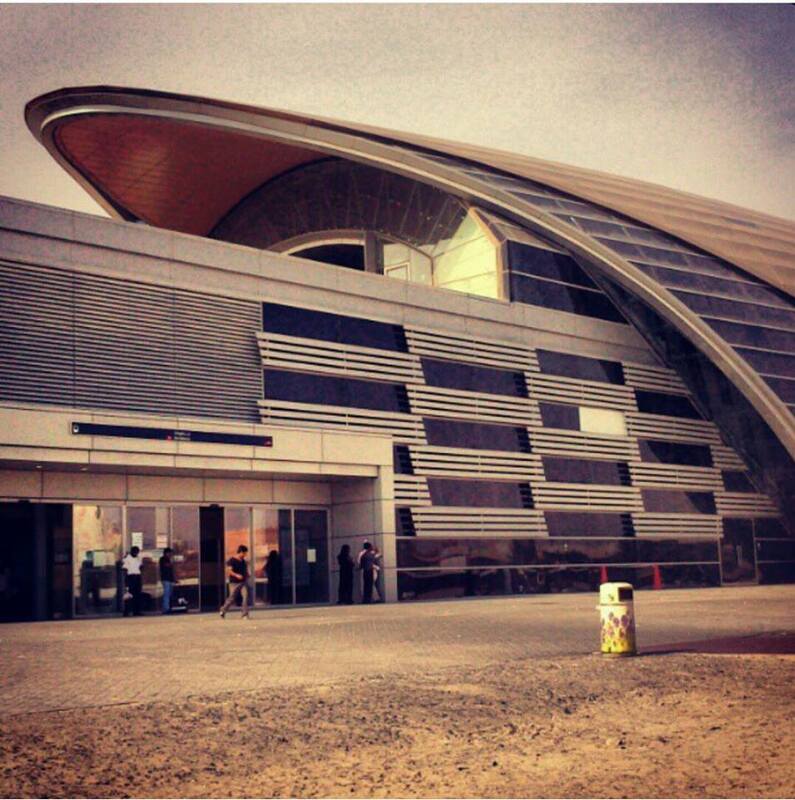 I went to UAE. I was excited and thought it was going to be the best decision I was going to make. I was free to choose the job that I want but freedom felt different then. I have given up every comfort and made it work thousands of miles away from home. I know it made me capable of doing anything. 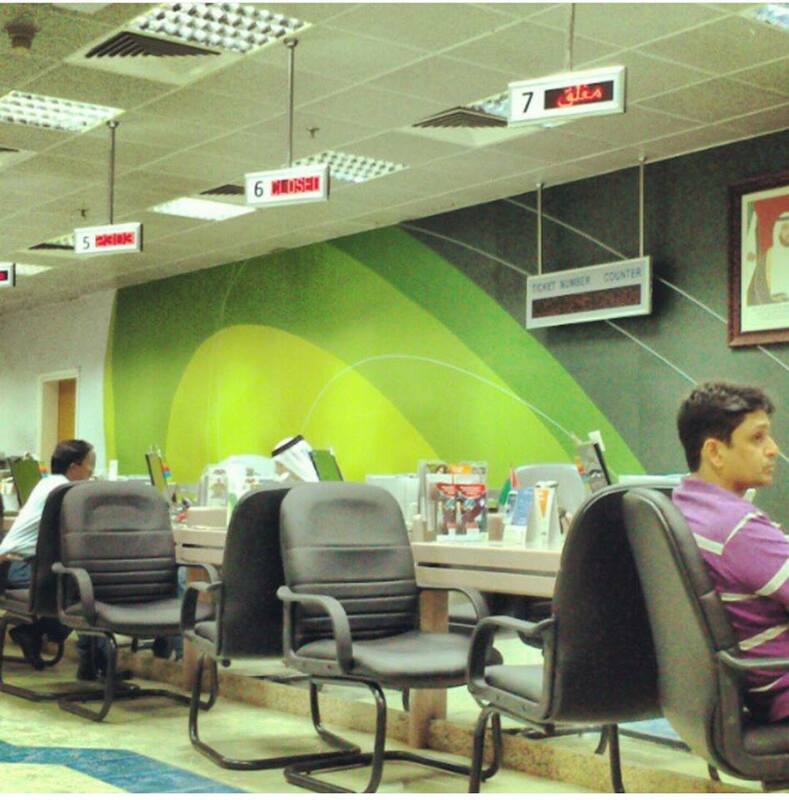 I applied as as Customer Service Representative at one of the established telecommunication in Abu Dhabi. I became this strong willed woman that I never thought I was. When Christmas came, I thought of sending money to my kids. I went to the nearest mall in my place which was the Al Wahda Mall and asked for a money transfer at the concierge. 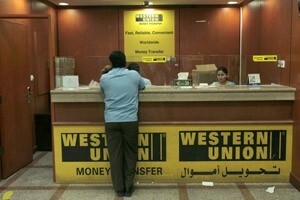 The lady advised me to Western Union located at the 2nd floor of the mall. Since I was a new they asked for my employment ID, mobile number and recipients information in the Philippines and filled up some card and gave me a Western Union ID for my next transaction. The transaction was very fast and after 2 hours my kid received the money and texted me about how fast it was. 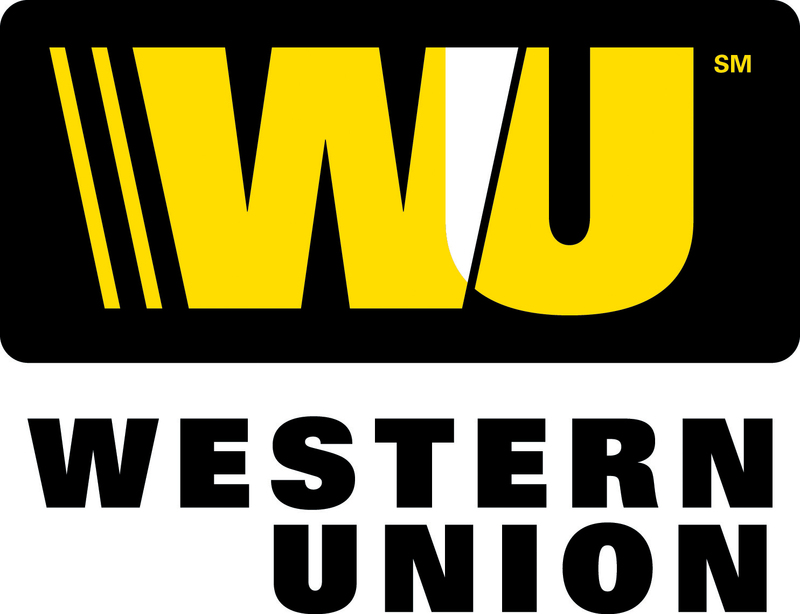 Since then Western Union became my choice of money transfer because it was faster, more convenient and much more cost-effective and has reasonable exchange rates. Somehow despite the homesickness being able to send money home quickly and easily gave me a bit of comfort knowing that it would make my kids happy. Remember those photo albums where our mothers kept memories of our first birthdays, graduation, first communion with labels intact in each page? Do you remember what you looked like? When we were innocent and dorky. What were the fashion trends then? Feeling nostalgic yet? During those days, my mother collected around 6 photo albums and showed it to anyone who visited our house. 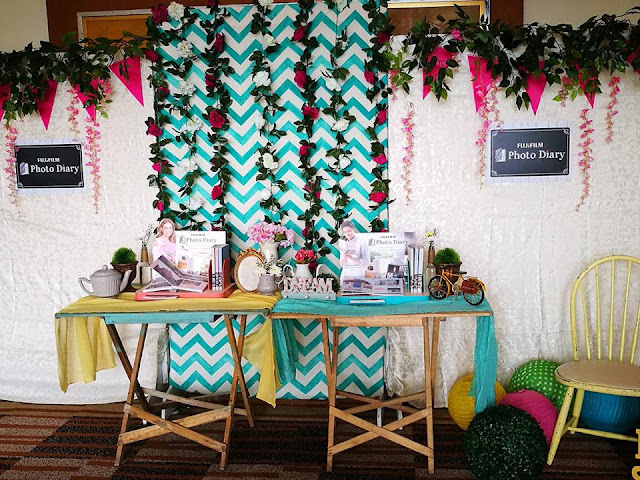 She was so proud of every celebration she took pictures of and kept it neatly intact inside an album. It was pretty awesome collecting pictures and put in an album during those years because that was the coolest/sweetest thing to do to preserve memories, at least to my mother. Now that I am in her age, I kind of like the idea now and would love to buy a photo album and print all my snapseed-ed pics taken from my mobile phone. And get creative with wasabi tapes and all those cute stationeries. Until FUJIFILM came up with Photo Diary. The best invention so far, my mother would be happy. 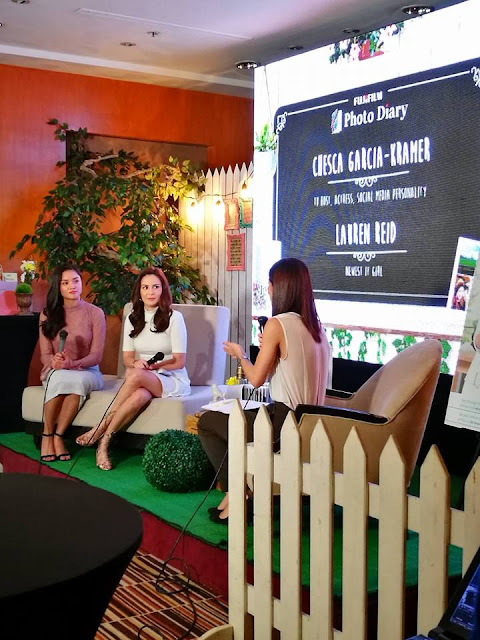 Recently FUJIFILM PH launched FUJIFILM Photo Diary with celebrity mom Cheska Garcia Kramer and Filipino-Australian model Lauren Reid, who’s also the sister of FUJIFILM endorser James Reid. 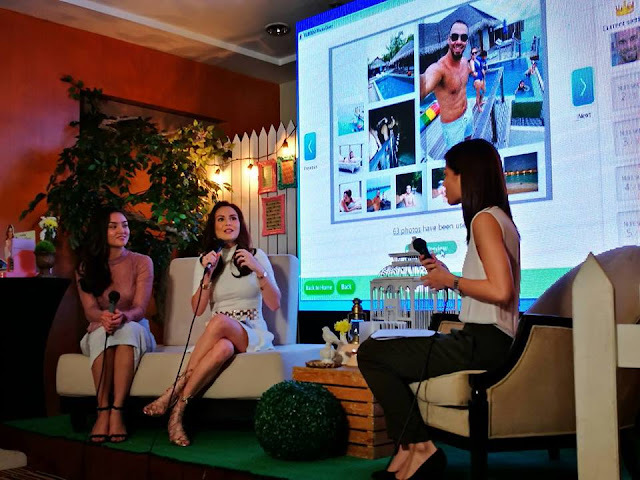 They discussed and shared their photo diary to the media and showed what photos they have collated. 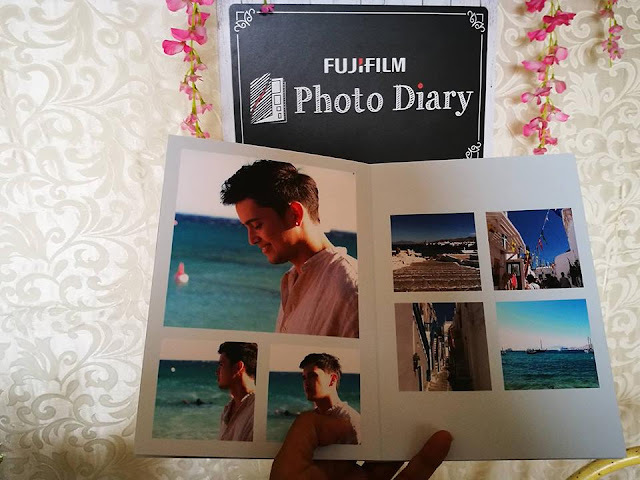 The Photo Diary is made of high-quality FUJIFILM photo paper and special insert material to make the pages withstand wear-and-tear. 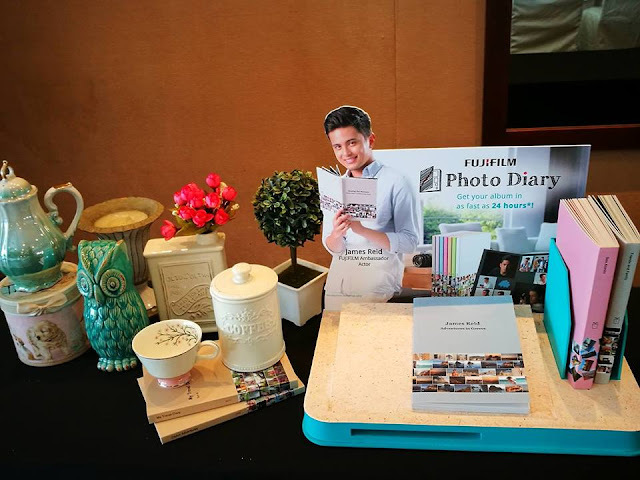 However, unlike the expensive coffee table books that take months to create, the best part about the Photo Diary is that it takes as fast as 24-hours to produce (production time may vary). 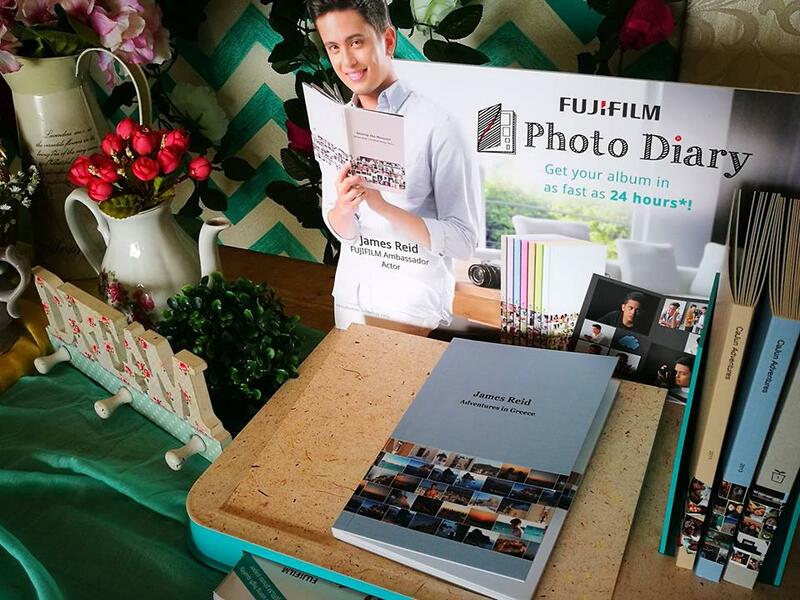 In just about a day or so, you can have your most treasured snaps in a high-quality, hardbound photo book. Everyone wants to preserve memories and organize photos into an album but it is a tedious task. Sorting through an overabundance of snaps and deciding on a layout takes time. 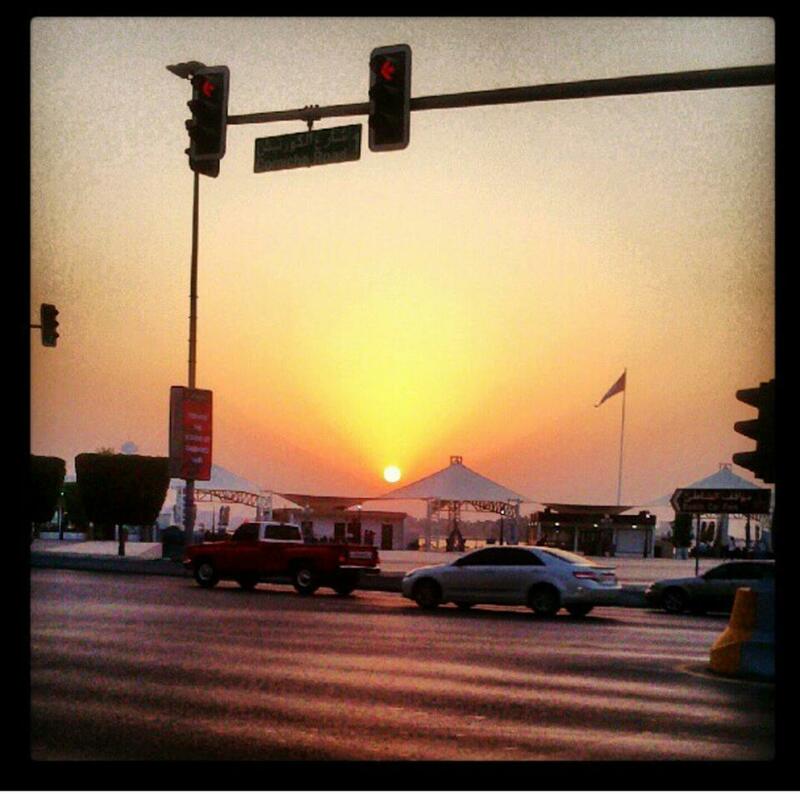 Another amazing feature of the Photo Diary is that it makes for a very handy repository of memories. It is like owning your own coffee table book instead of the traditional photo album. 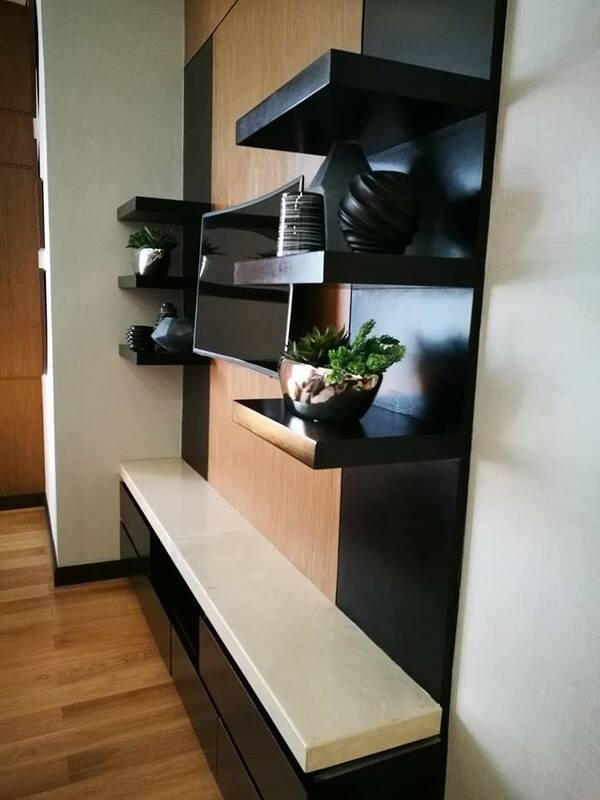 It is not bulky and can be tagged along wherever you go. 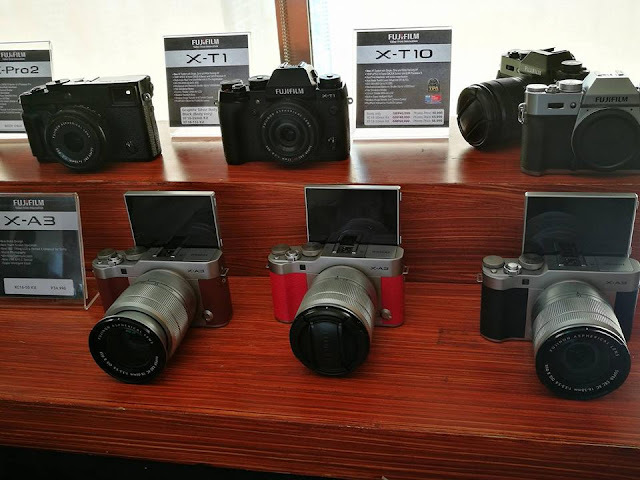 FUJIFILM is confident that Filipinos will take to the Photo Diary very well because Filipinos are a photo-loving nation, from mothers who cherish and preserve memorable family moments to young millennials who express their creativity with well-curated and stylized photos. The Photo Diary is the perfect tool to document life’s important milestones: weddings, birthdays, graduations, and favorite travels. The price of the Photo Diary starts at Php 999 for a minimum of 16 pages, up to Php 2,199 for a maximum of 40 pages. Available at the Wonder Photo Shop and F UJIFILM authorized dealers, the Photo Diary is a fun, easy, and modern way of documenting photos and making them a lasting keepsake, handed down horn generation to generation, and shared among family and friends. Its Christmas shopping time at Tutuban Center! I consider myself lucky during the christmas season because I live near Tutuban Center where I have all the time to shop without braving the traffic. I literally walk my way from the house to Tutuban Center and the Prime Block. 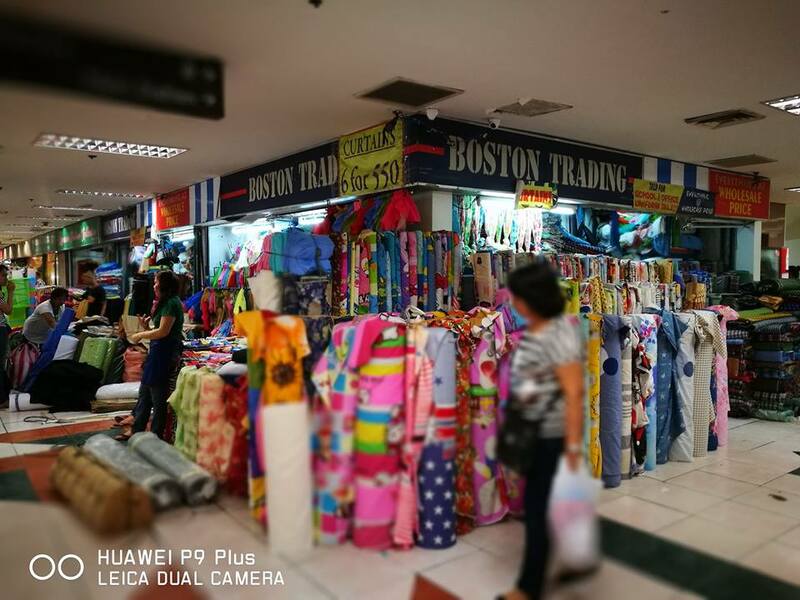 Now why I love Tutuban is that it has all the things I need for a fraction of a price found at the mall. 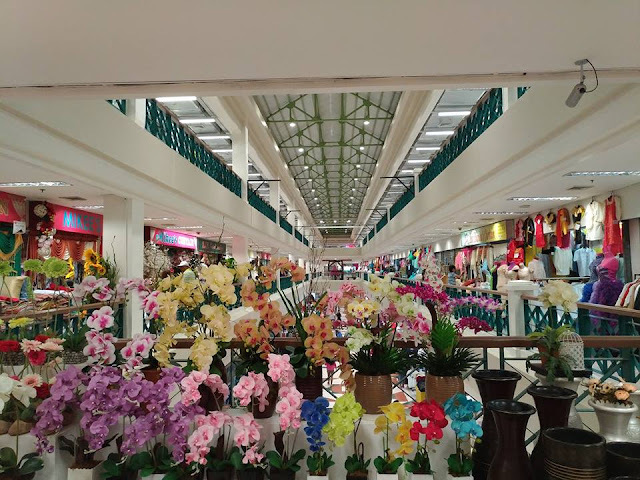 If Im not available for daytime shopping and or if there is an errand shopping needs to be done for everyone in the family, like halloween costumes, christmas decorations, cute gifts for monitos and monitas, and or christmas exchange gifts, there is a night market to consider which opens from 7pm onwards. For the make up addicts, holler for the makeup brushes selling php400 for a set, you can choose from synthetic to goat's hair. Authentic Victoria Secret Lotion to Anna Sui's perfume mini samples. I know the store, just leave a message and lets have a date at Tutuban. 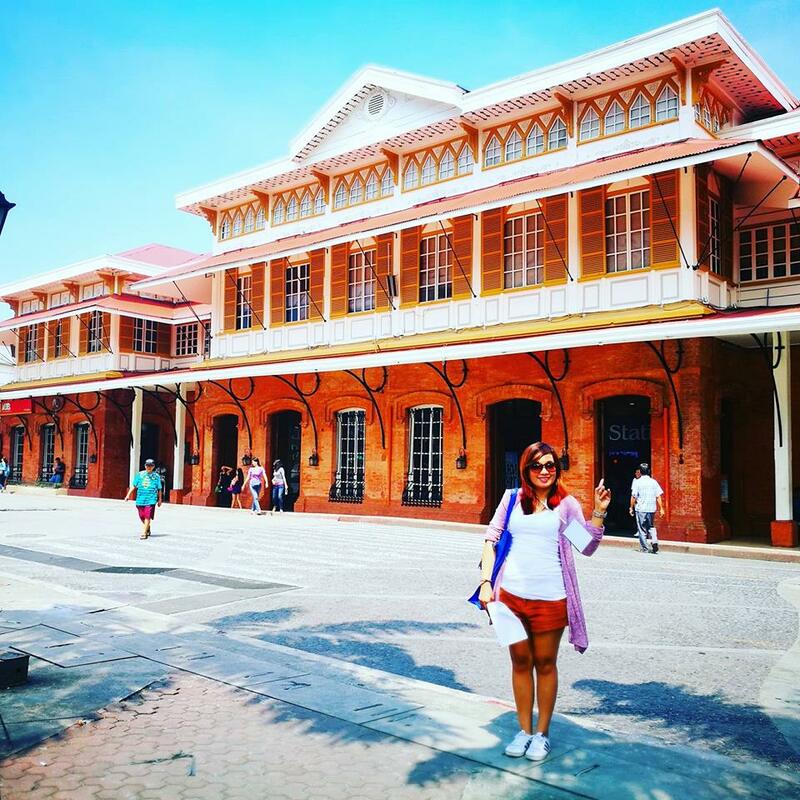 If you are a first timer at Tutuban and commuting, take the LRT or LRT2 it is the safest and easiest transpo to get to Divisoria. 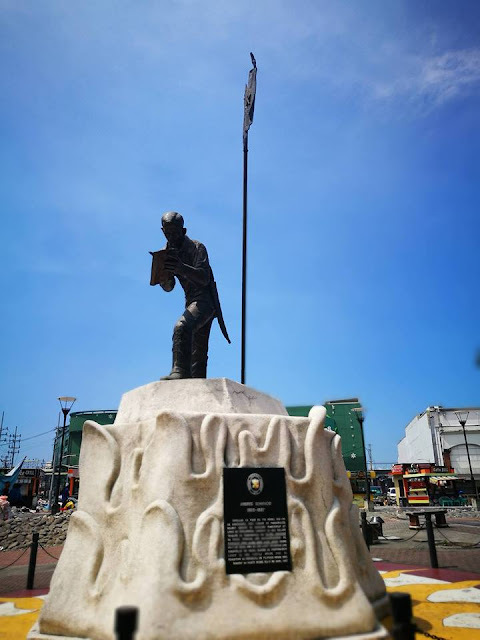 Get off at D. Jose Station from the LRT route, Recto Station from LRT 2 , and take the jeepney with a sign board Tutuban Divisoria plying around Recto/Sta.Cruz Area. Now lets explore Tutuban Center! 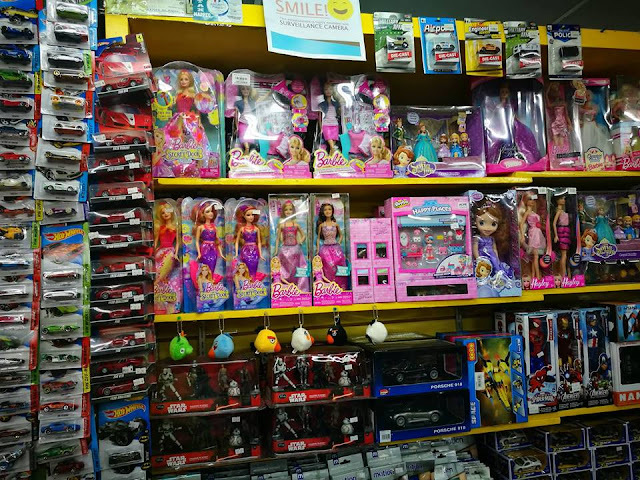 If you are looking for toys to give to your inaanaks or kids this christmas, let me guide you where to shop. 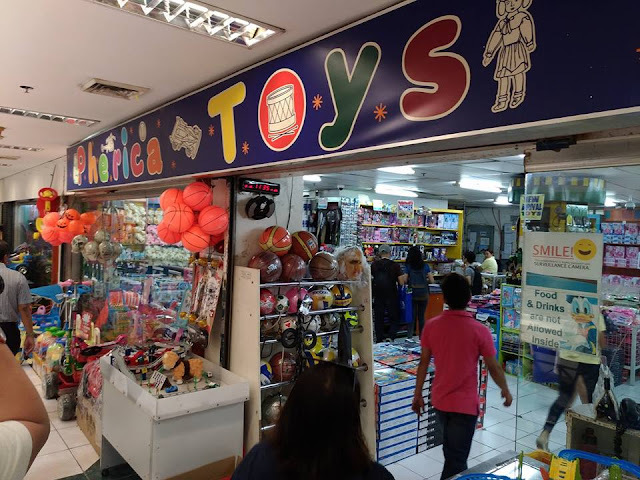 There is a Pherica Toys store where you can find the cheapest and the cutest picachu, pokemon, transformers, snakes and ladders, keychains, game boards. Price range from php50 up. It is located at the Prime Block 2nd Floor. There is also Andings Toy Store at the 1st Floor Prime Block, where you can find quality toys from Barbie to Lego to Starwars to costume accessories at a discounted price. 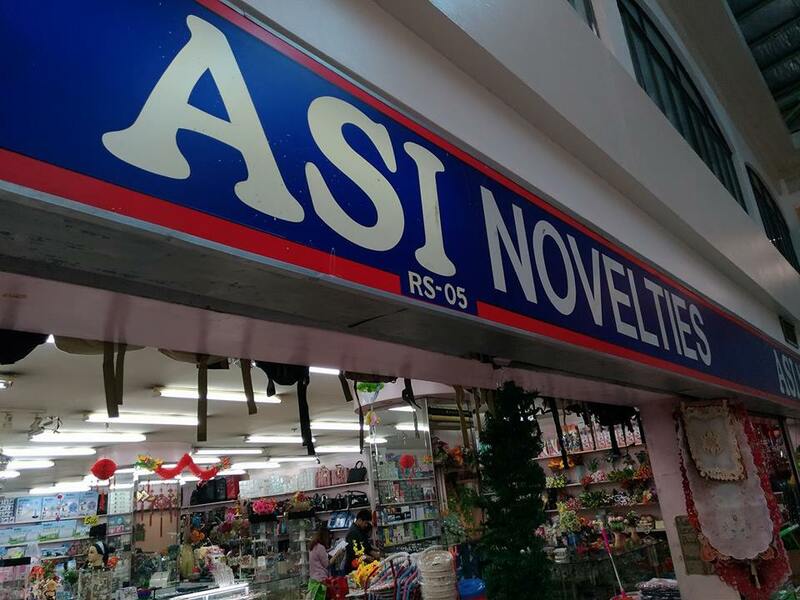 They are also selling christmas decorations in case youre not putting your christmas trees, parols and christmas lights yet. 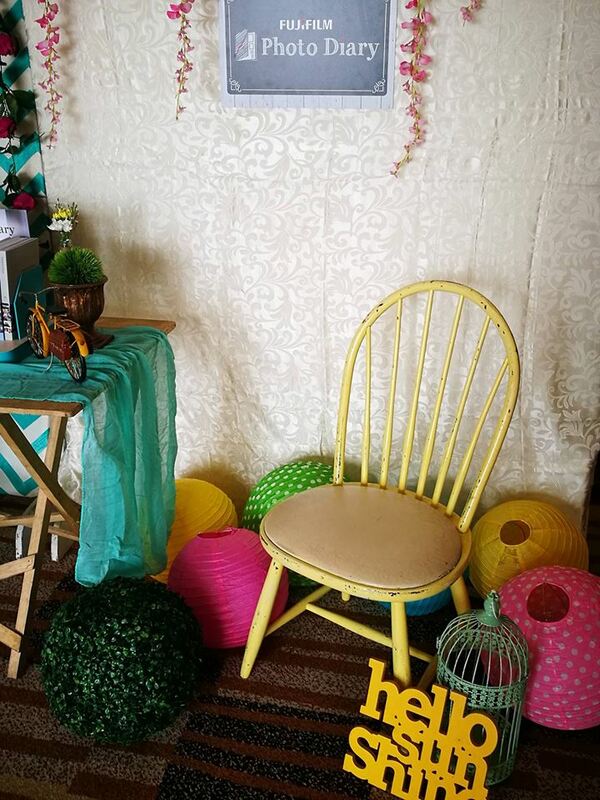 Everything from party favors, garden accessories and holiday decor is offered by the establishment. 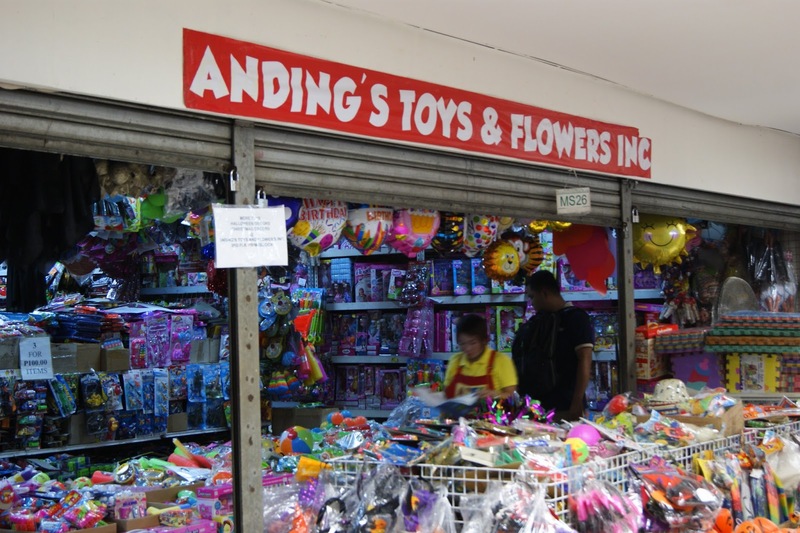 Anding’s has been in business for over 20 years and counts large malls and merchants among its clients. Its merchandise is so wonderfully varied that the store takes up about 317 sqm. or about 18 stalls. 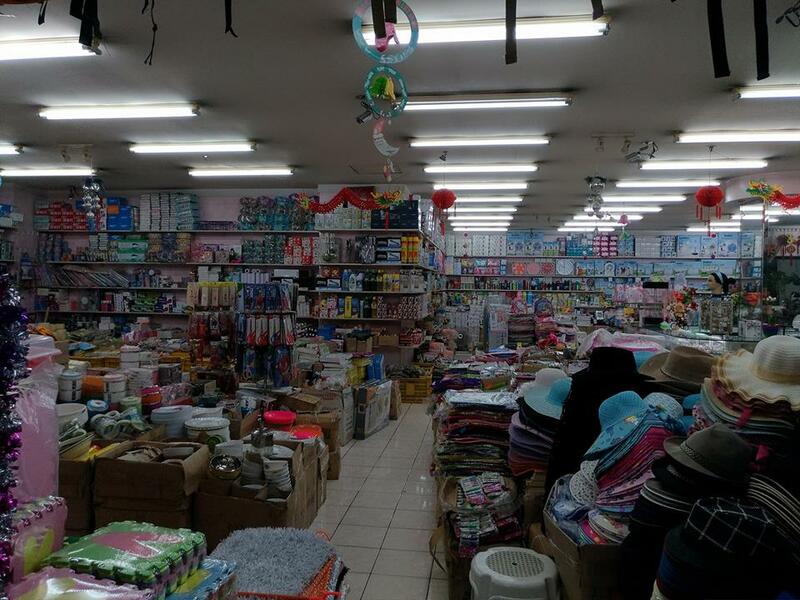 general merchandise stores that offer an array of home and personal items ranging from hardware and cookware, to school supplies and bath accessories. Houseware, linens and curtains also abound. Tutuban Center, the bargain hunter’s paradise, has unveiled new and exciting features to pump up your shopping experience. The center recently underwent a number of renovation work and building improvements. 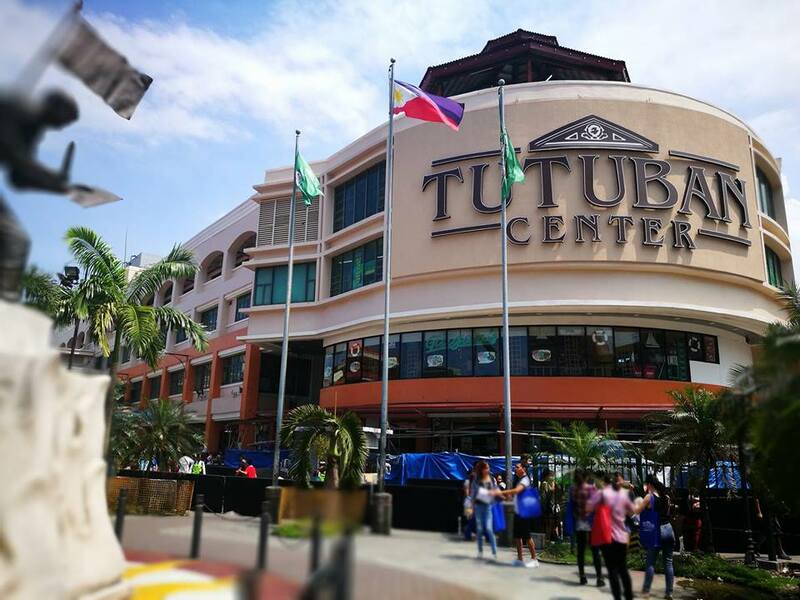 With the holiday season coming, shoppers will make a beeline for the great deals in Tutuban Center’s Main Station and Prime Block. 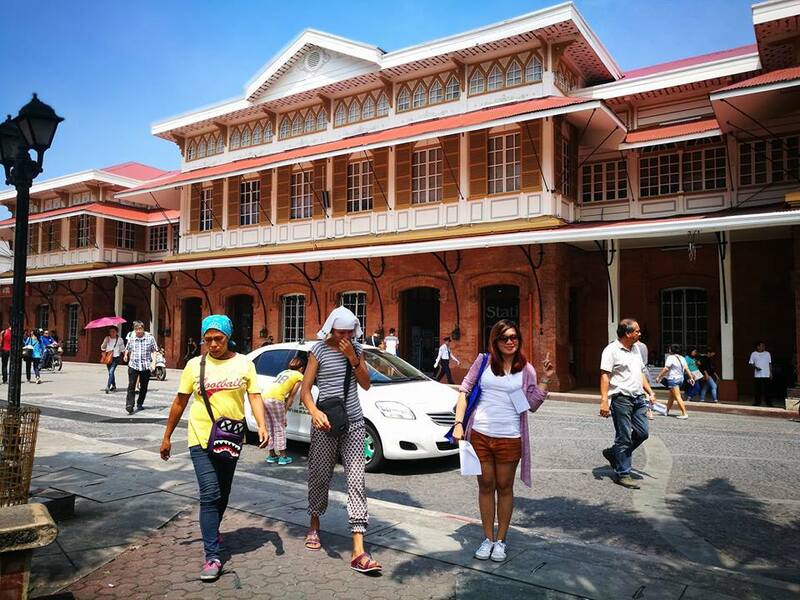 Tutuban Center Main Station, with the Bonifacio Shrine across its entrance, is a heritage building where the original train station built in the 18005 first stood. As a heritage building, steps were taken to preserve its history including repainting based on the heritage color palette, and improving lighting for its facade details. The building has also retained features like brick walls and century-old wrought iron pillars that lead all the way to the food court. 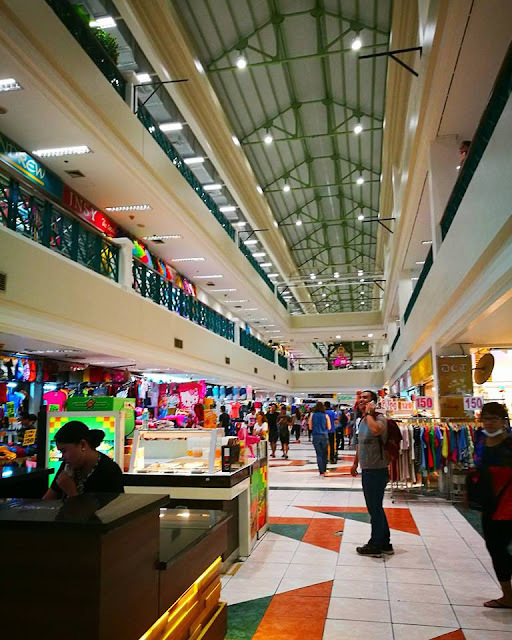 The new and more spacious food court will soon offer some of Divisoria and Binondo's best food brands like El Presidente, Kikiam in Ilaya, King's Bakeshop and Eng Ho. Refreshing drinks and snacks from several food carts are also available. Picnic tables can comfortably seat shoppers taking a break. The Main Station holds the mall’s retail shops, restaurants, and service stores. 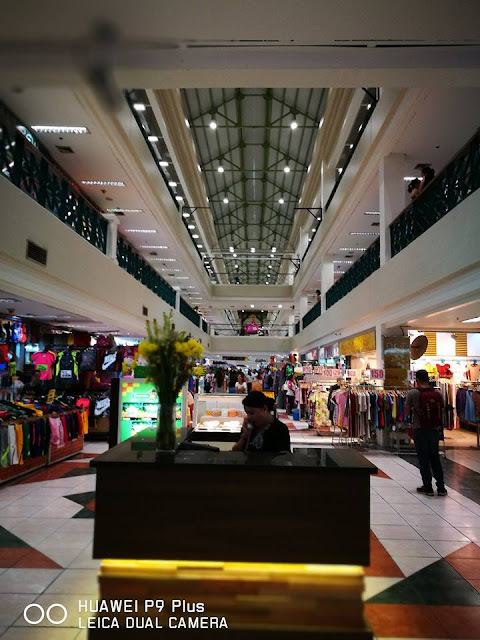 This connects to the Prime Block, which offers Tutuban Center’s revitalized shopping experience. 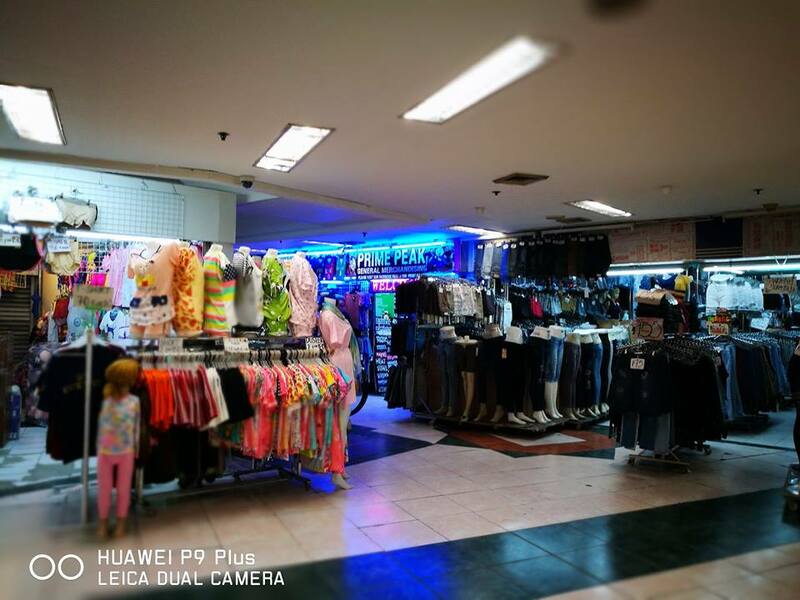 Three shopping levels of pure bargain buying pleasure await visitors. 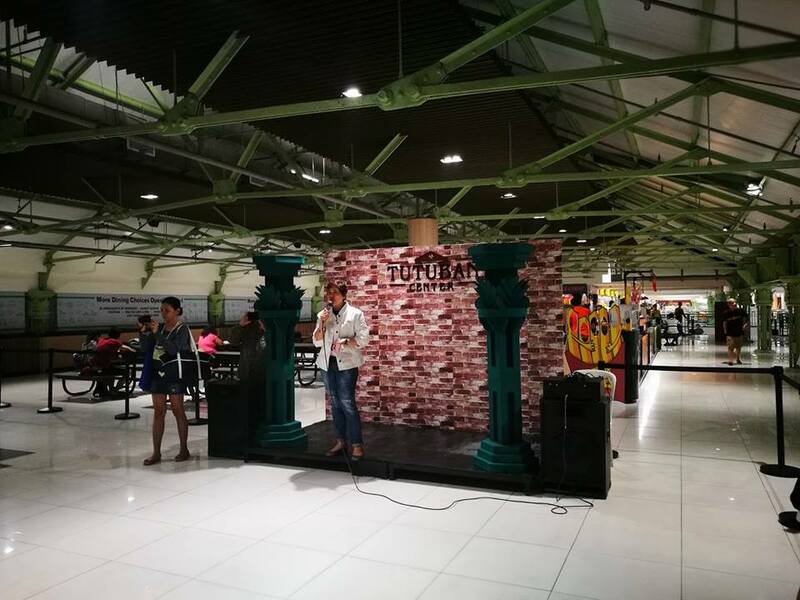 “We have introduced a cluster of stalls in level 3 of the Prime Block, which is now tagged as the Prime Block Clusters," explained Norie U. Raniel, Tutuban Center Deputy General Manager/Operations Head. "Merchandise zoning has been improved in the Prime Block building so that shoppers will find everything they want and need in each area." 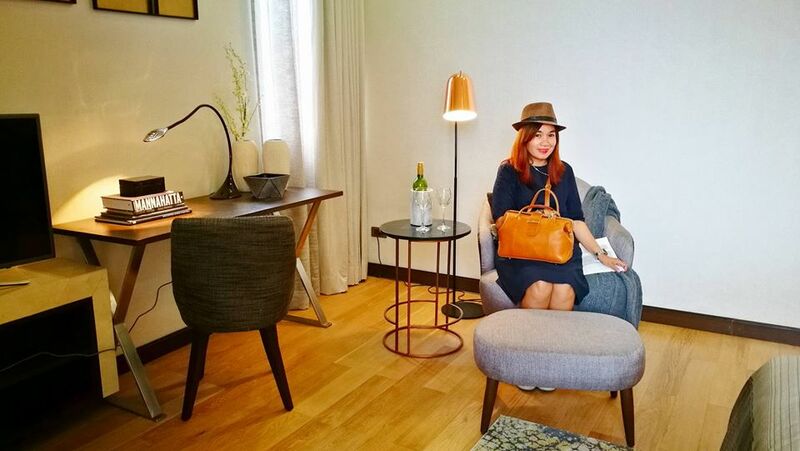 The Prime Block offers a Shopper’s dream of choices, while seeing to their comfort and security. Clothes for every occasion, the latest RTW, even costumes and sleepwear are organized. Footwear, bags and fashion accessories are there to match the outfit of the day. Fabrics, patches, beads and other trimmings are available for people who prefer DIY fashion projects. Entrepreneurs and small business owners will find their supplies of cosmetics, personal care, grooming kits, spa and salon supplies available here. 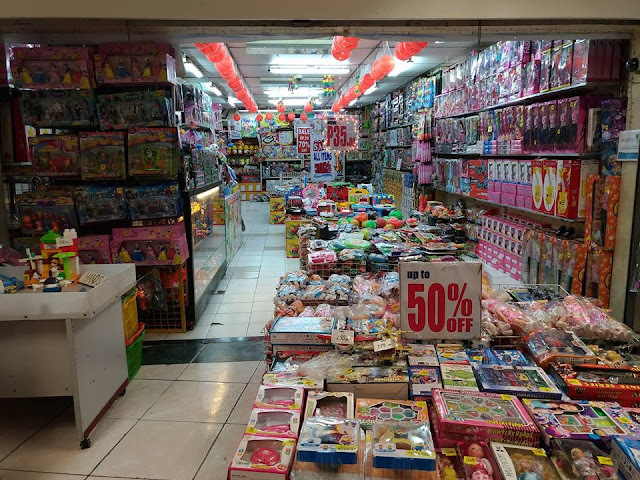 Party planners will find the Prime Block a one-stop shop for colourful gift items, wall and table decorations, toys and games, and costume accessories. 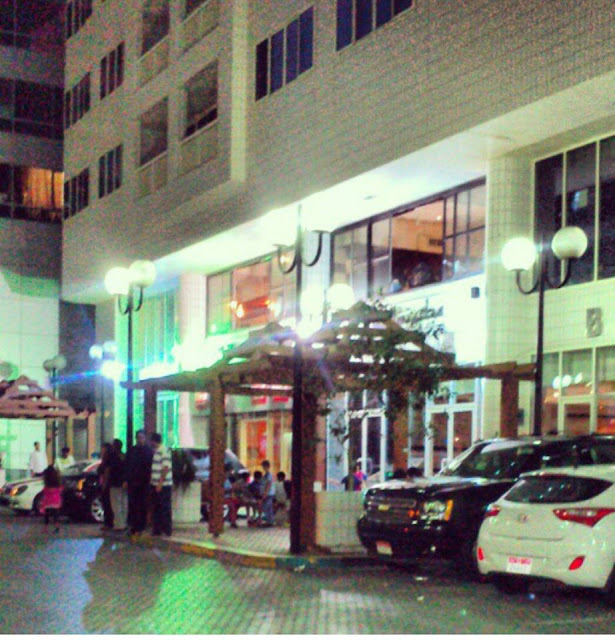 Whether it's a wedding, a children’s party, a corporate launch, a get-together, or big events like Halloween and Christmas, the Prime Block offers the party needs for every occasion. 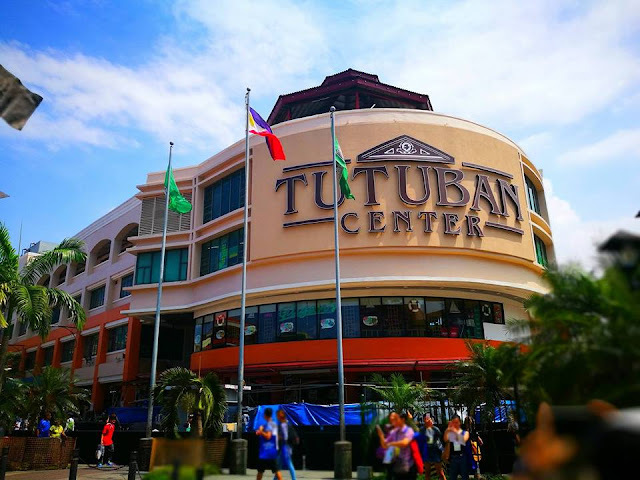 Tutuban Center welcomes shoppers as early as 9:00 AM every day. 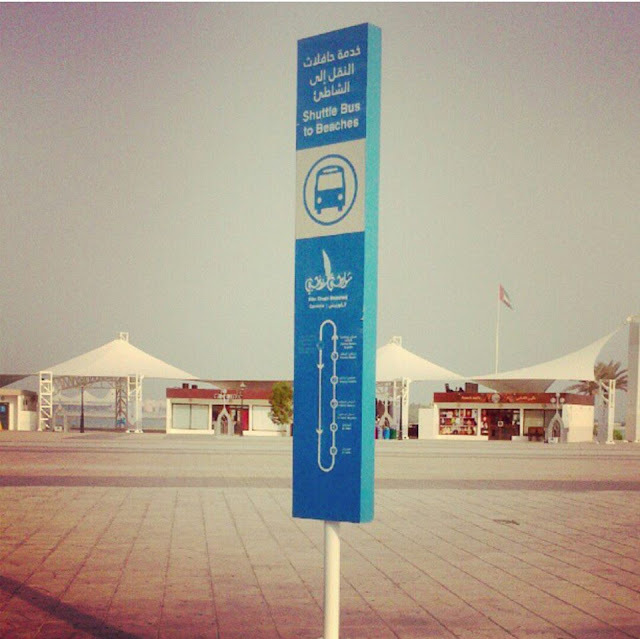 Visitors will appreciate the enhanced pedestrian and vehicular circulation across the development. An additional 150 parking slots has been built into its CM Recto Avenue paid parking area. With all these improvements, it’s not hard to see why Tutuban Center is still Divisoria’s top shopping destination. 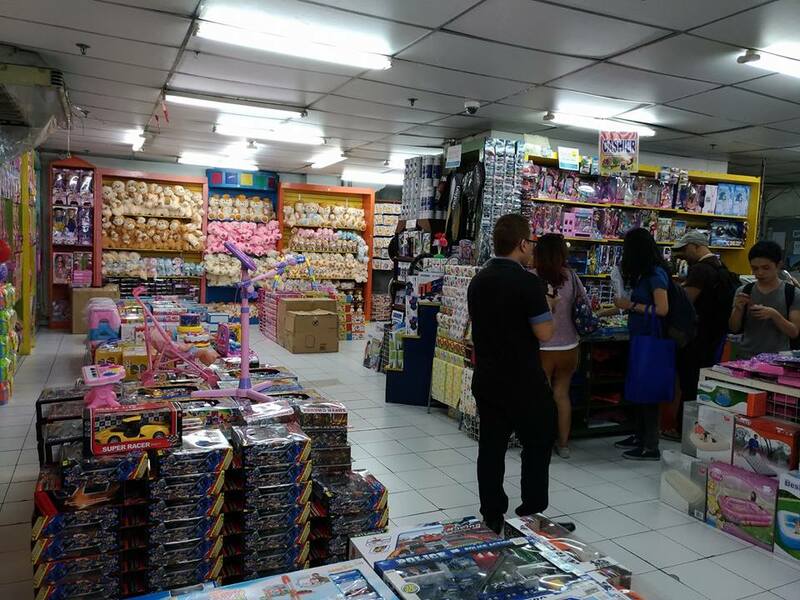 Labels: Divisoria, Norie U. Raniel, Tutuban Center, Tutuban Center Deputy General Manager/Operations Head.